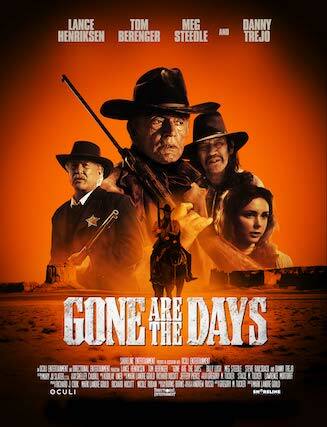 Gone are the Days is the first feature film by Director/Producer Mark Landre Gould. It’s a gritty western without all the shoot-em-ups. “It was an incredible first feature experience. The fact that we were able to get such a great cast and crew, then get picked up by Lionsgate is amazing,” stated Landre Gould. This is a unique film in that the dialogue is minimal. It is a character study of an old and sick outlaw who wants to set things right with the daughter he abandoned when she was a baby. The movie is a bit discombobulated, as viewers have to piece the scenes from his past together with his present to figure out exactly what has happened to Taylon and how he ended up where he did. Is it his sickness that brings up the hallucinations of his past or the heroin he is taking to help him through his illness? Taylon is on his last leg (not literally) and before he dies he wants revenge and also some peace for the daughter he never knew. He devises an elaborate scheme to put everything in motion and heads out of his ranch toward Durango. The sheriff in Durango is his old friend Will (Tom Berenger) who has been keeping tabs on Taylon over the years. They have a history that is revealed at the end of the show, but they also have a secret that has been shared their whole lives. Before he dies, Taylon must set things right. This isn’t a movie filled with action. 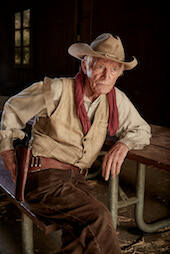 It is a slow-moving story of an aging outlaw in a land of good and bad. He finally wants to do something good before he dies. Gone are the Days opens in theaters March 23, 2018.